Drive: 1/4'' hexagon, suitable for DIN 3126-D 6.3, ISO 1173 Insert Bit holders. Design: Insert Bitorsion for long service life, diamond-coated for secure screw fit. The effectiveness of the Insert Bitorsion system comes from a combination of two shock-absorbing spring elements. Optimal work on these screws is possible with the PlusMinus profile. 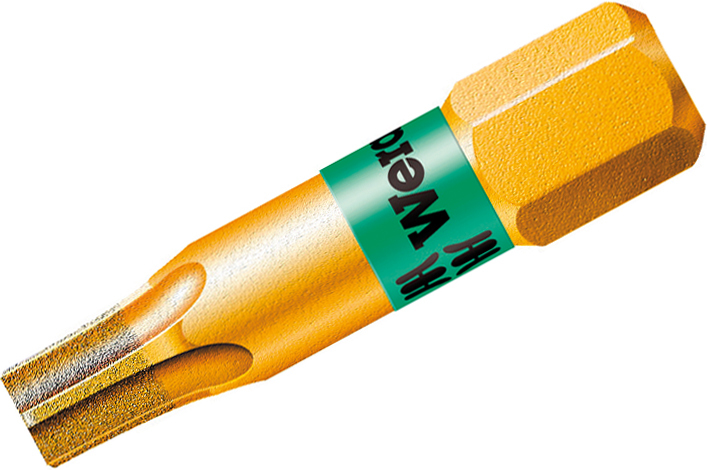 Wera Insert Bitorsion Insert Bits are recognisable through the letter B.
Wera Insert Bitorsion Torx Insert Bits are available in Tough (BTZ), hard (BTH), and with diamond coating (BDC). The 05066108001 Wera 867/1 BDC 1/4'' Torx Insert Bit is one of thousands of quality tooling products available from MRO Tools. Please browse Wera 1/4'' Torx Insert Bits for tools similar to the 05066108001 Wera 867/1 BDC 1/4'' Torx Insert Bit. 05066108001 Wera 867/1 BDC 1/4'' Torx Insert Bit description summary: Wera 867/1 BDC 1/4'' Torx Insert Bit. Point Size: TX 30 Shank Overall Length: 25mm / 1'' Quantity discounts may be available for the 05066108001 Wera 867/1 BDC 1/4'' Torx Insert Bit. Please contact MRO Tools for details.